With its three key pillars of food, service and itineraries, Oceania Cruises is out to impress. Sophie Griffiths embarks Riviera to put the hat-trick to the test. The collective breathing is heavy, and to my left I hear a groan of pain. Around the room, the group is contorted into varying positions, gritting our teeth to maintain an inelegant pose that involves tensing our stomach muscles tightly. Our instructor Michael counts down from 10, and as he reaches zero we collapse on our mats with a sigh of relief. Within seconds we are cursing him again, as chuckling, he instructs us into another abs-crunching pose. I distract myself by focusing on the deep blue of the Mediterranean and shimmering Italian coast sliding past us. I am in what seems to be a hybrid Pilates/abs workout complimentary exercise class on Oceania Cruises’ 1,250-passenger Riviera – it’s one of a number of classes ranging from indoor cycling and stretch and relax to yoga and total body workout that are offered to guests for free. I reflect that this is going to come in handy, given that the food onboard Riviera is some of the best I have ever tasted. My sister Laura and I are sailing on a section of a seven-day Mediterranean Havens itinerary, from Athens to Livorno (although the cruise continues after we disembark, ending in Barcelona). My sister, whose previous ship experience is limited to cross-Channel ferries, is open-mouthed as we board. The line positions itself as upper-premium, and the decor reflects this, with dark wood panelling and rich furnishings. Most staterooms feature private teak verandas (there are just 15 inside staterooms and 20 oceanview staterooms without one), as well as separate bathtubs and showers, complete with marble and granite bathroom surfaces. To our delight, Bulgari amenities are replenished regularly. Our own stateroom is Concierge level, meaning we are able to enjoy additional benefits such as access to the private Concierge Lounge, which later proves particularly helpful for printing our flight tickets free of charge. 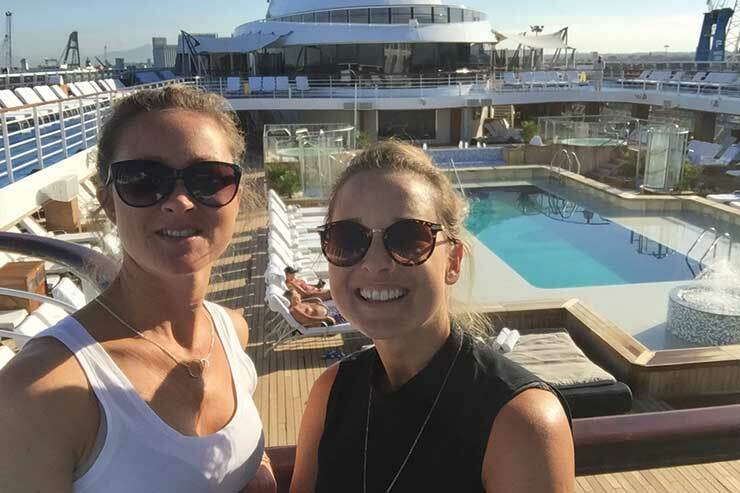 It also includes unlimited access to the Canyon Ranch SpaClub terrace – a private space at the ship’s bow, lined with comfortable sunloungers looking out to sea, and a large thalassotherapy pool. 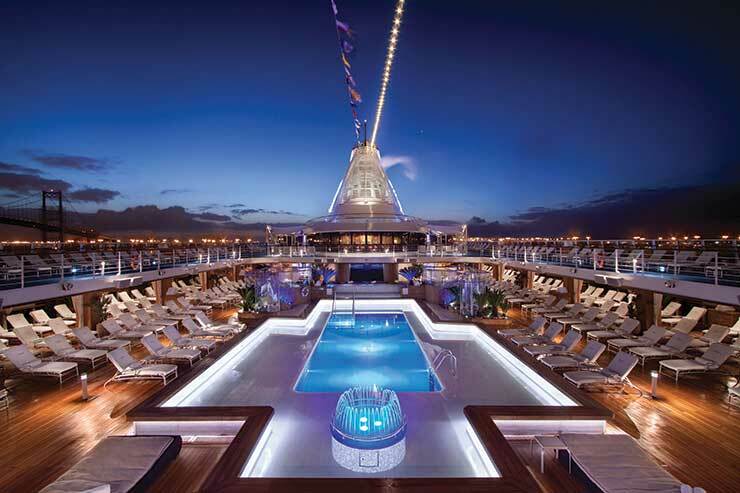 The ship’s upper-premium feel is also evident in its inclusive offering for passengers. Soft drinks, including Coke, Sprite and bottled water are complimentary, as are tea and coffee, and all are included in the stateroom minibars and available from the ship’s bars. Complimentary room service dining is available 24-hours a day, while dining at four of the six speciality restaurants – Toscana; Polo Grill; Jacques and Red Ginger – is included, although reservations are a must as these eateries are extremely popular. Indeed, the ship’s menus in all restaurants – from the Grand Dining Room to the Terrace Cafe buffet, as well as French speciality restaurant Jacques (and the other speciality restaurants) have been influenced by renowned French chef Jacques Pepin. “And have you tried the buffet?” Claudio asks excitedly. “It’s a buffet that’s not really a buffet.” I understand what he means when, tired and hungry from travelling on our first evening on the ship, we decide to eat in the Terrace Cafe. Its warm furnishings, decorative lighting and laid-out tables, complete with more tables and rattan furniture overlooking the sea on a terrace, is unlike most ship buffets I have experienced. And when it comes to choosing food, staff behind the counters insist on serving us personally. 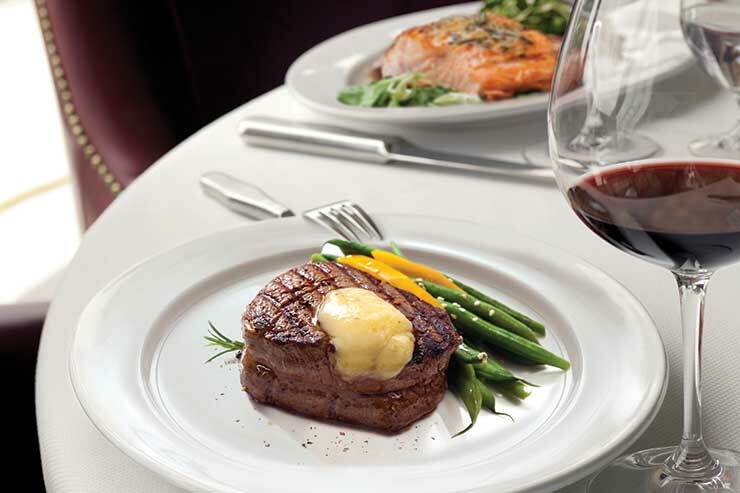 Spoilt for choice, we end up opting for steak cooked to our liking and brought to the table. “The buffet is unique,” agrees Claudio. Unfortunately, given our short time on the ship we are unable to put Claudio’s claim to the test in all the restaurants, but the delicious cuisine we enjoy in those we do sample – the Italian speciality Toscana, Asian fusion eatery Red Ginger, and steak haven Polo Grill – affirm his assertion. Another of the pillars mentioned by Claudio is Oceania’s focus on itineraries, which don’t just include a varied selection of ports but also comprise destination-focused onboard lectures and wide-ranging and unusual excursions, including Oceania Exclusive Excursions for guests wanting more intimate tours for a maximum of 16 guests. In Naples, for instance, guests can enjoy the city, travel to Sorrento, take a private motorboat to Capri, experience Pompeii and Herculaneum or “learn the secrets of southern Italian cooking” with a Taste of Italy tour. private railcar”; a visit to the Italian countryside and catacombs; a tour of the Jewish quarter; a trip to “undiscovered Italy”, visiting Orvieto in the Umbrian region or wine tasting near Bracciano Lake – a body of water formed in an ancient volcanic crater. As my sister has never visited the Italian capital before, we opt for a “Rome on your own” excursion, which includes an hour’s coach trip with a guide, who provides us with a map helpfully marked with routes to the famous sites. 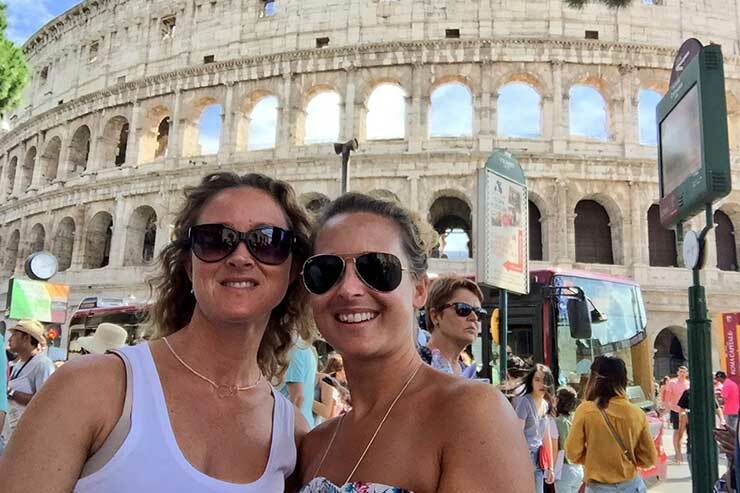 We spend a long and happy day traversing the cobbled streets of the Eternal City; gazing in wonder at St Peter’s Basilica, marvelling at the ancient ruins of the forum and enjoying the cooling mist of the Trevi fountain as we bask in the Italian sun and slurp gelato. Returning to the ship, we are greeted by smiles from the ever-attentive staff – another pillar Claudio highlights. “We hire for attitude and then we train for the skills,” he says. This is why nothing ever seems too much trouble for the crew and why, with a guest to staff ratio of 1.56 to 1, someone is always on hand to help. Back in the workout session, however, I am thinking less fondly of one particular crew member. Michael grins as he tells us we have 10 more seconds left. I grit my teeth and distract myself from the muscle burn by pondering which dessert to have for our last meal that evening in Polo Grill – naturally I’ve already checked the menu. A self-confessed chocoholic, I deliberate between the seven-layered chocolate fudge cake or the chocolate mousse burger. In the end, I get to sample both. After a delicious steak with blue cheese sauce, my sister insisting it is “the best steak I’ve ever had”, we opt for the Polo Quintet – a smaller selection of each of the restaurant’s most popular desserts – with the seven-layered chocolate fudge cake on the side for good measure.